New to the industry and looking to improve and develop your understanding and knowledge of leak testing? Need to implement a leak testing system into your production process? LACO Technologies’ Introduction to Production Leak Testing Training will help place you on the path to successful implementation of a leak test system and will provide you with a basic knowledge and understanding of leak testing fundamentals. Upon completion of the training course you will receive the Introduction to Production Leak Testing Certificate. LACO’s Leak Test Training Tour coming to a city near you! In 2016, we will be bringing this leak testing training course to cities all across the United States. Our leak testing experts (with over 30 years’ experience in leak testing) will be traveling across the country hosting leak testing certification training in major metropolitan areas for your convenience. Be sure to visit our website, follow our social media pages (LinkedIn, Facebook, Twitter, and Google+), and/or subscribe to our email newsletter to see when we’ll be in your region. Introduction to Production Leak Testing is designed for those who are new to leak testing and need to improve their current understanding, those who are in the early stages of implementing leak testing into their production process, and those looking to improve or change their current leak testing procedure. What are the benefits to you and your organization? You will become more confident in your knowledge and understanding of production leak testing which will help you develop in your role, and help you improve leak testing implementation at your company/organization. You will have a better understanding of different leak testing methods including the pros and cons of each, and will learn a process for selecting the optimum leak testing method. In addition to the above benefits, you will have access to a leak testing expert and have the opportunity to ask questions and get answers to problems you may be facing. How do I register and what is included with my training registration? In order to register for this training course contact us through our website, send us an email, give us a call, or contact your local LACO representative. There is a nominal registration fee of $250 per person which includes one full day of leak testing training conducted by a leak test expert, course materials, a complimentary lunch, hands-on demonstrations of leak testing equipment, and a certificate of course completion. You will receive a 25% discount on your training registration if four or more people from your organization are attending the training course. Registrations must be submitted together. Spaces are limited, so please be sure to register early when the training tour comes to your region. We can also deliver our Introduction to Production Leak Testing Training to your staff onsite. In addition to this training course, we have advanced courses, and tailored training courses to meet your specific needs. For more information please contact our leak testing team at 801-486-1004 or info@lacotech.com. 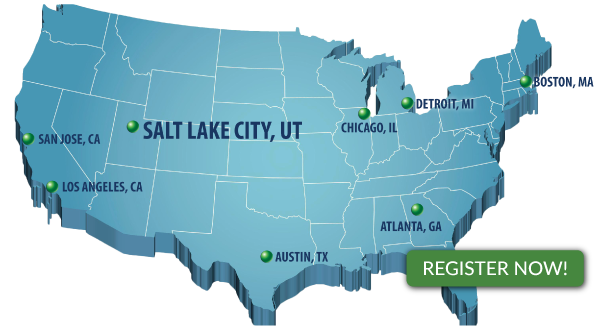 Our next stop...Salt Lake City, Utah - Register Today! - What is a helium leak detector? Contact our local sales representative, Chris Romero, at chrisr@lacotech.com or 801-884-6759 to reserve your spot.